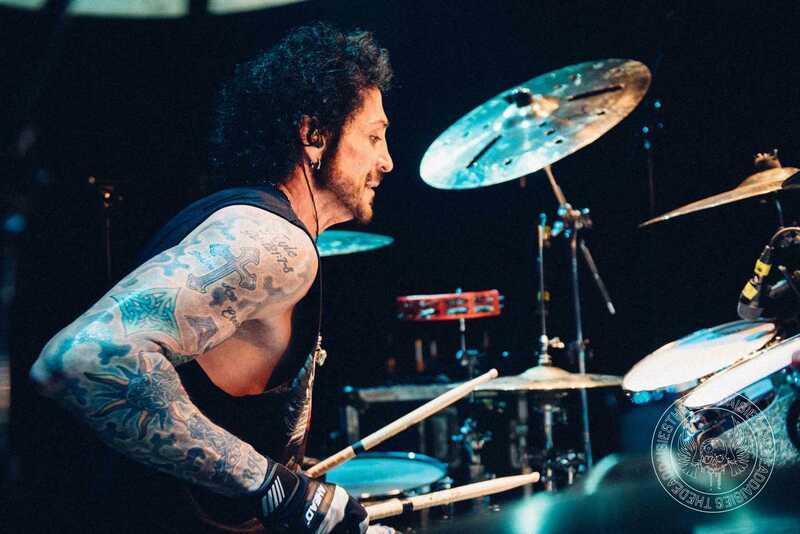 “I got my first drum kit at age 6 and at the same time was introduced to Kiss by my older brother. I began listening to every record I could get my hands on. I heard Rush’s “All The World’s A Stage” and Neil Peart immediately became my drum hero. While playing with guys twice my age I was told to learn Journey’s “La Do Da” and since I had the highest voice I had to sing it as well as play it. Steve Perry and Steve Smith became my biggest influences from that time on. I got my first big gig at 16 with a band called The Enemy and we opened up shows for bands like Blue Oyster Cult And Foghat. I was discovered by a metal band called Wild Dogs that were signed to Shrapnel Records and that’s when I started listening to and playing Heavy Metal & Thrash Metal. While working with them I was offered the drum slot with Tony MacAlpine, an incredibly gifted guitar shredder. While rehearsing with Tony one day in San Rafael, Neal Schon walked in. We started jamming Journey songs and when we finished up he had me listen to some material he was working on for a solo record. We exchanged numbers and about a week later he called me and asked me if I would fly to LA with him to audition for a new band with Jonathan Cain, John Waite and Ricky Phillips. I got the gig and that band became known as Bad English. We recorded two successful albums until the band met it’s untimely end. After that, Neal took me everywhere he went from Hardline to Paul Rodgers. After the Paul Rodgers gig I began doing session work with Steve Vai and made two albums with him. One day out of the blue I got a call from Steve to audition for Ozzy Osbourne. I landed that gig and went on to record “Ozzmosis” and did a South American Tour. When the entire band was let go I ended up doing a ton of session work for producer Michael Beinhorn, recording with Social Distortion, Geezer Butler’s solo project and Hole. After that I performed with Vasco Rossi, the “Bruce Springsteen of Italy” for 3 years. When that ended Neal Schon called me again asking me to join Journey. I was with Journey for 18 years, making amazing records and touring the world. During that time I also made a record with Doug Aldrich and Jack Blades called Revolution Saints where I was Lead Vocalist & Drummer. I had to take care of my family and myself and tackle my mounting drug issues which led me to taking 18 months off of playing music to be completely focused on getting my life back on track. In April of 2017 I decided I was ready to get back into the ring and recorded another Revolution Saints record.